Centered within a loose collection of city-states (often at war with one another), ancient Greek culture reached its pinnacle during the fourth century BC - an era described as its "Golden Age." Art, theater, music, poetry, philosophy, and political experiments such as democracy flourished. Greek influence stretched along the northern rim of the Mediterranean from the shores of Asia Minor to the Italian peninsula. In Athens, society was male-dominated - only men could be citizens and only upper-class males enjoyed a formal education. Women had few political rights and were expected to remain in the home and bear children. Fully one quarter of the population was made up of slaves, usually prisoners captured during the many clashes that extended Greek influence overseas. These slaves provided much of the manpower that fueled the burgeoning economy, working in shipyards, quarries, mines, and as domestic servants. Most homes were modest, windowless and wrapped around a courtyard. Furniture was rare. People spent the majority of the day out of doors enjoying the mild Mediterranean climate. The Greek diet was also modest, based largely on wine and bread. A typical day would start with bread dipped in wine, the same for lunch and a dinner of wine, fruits, vegetables and fish. Consumption of meat was reserved for special occasions such as religious holidays. "Why, then, Socrates, my habit is to rise from bed betimes, when I may still expect to find at home this, that, or the other friend whom I may wish to see. Then, if anything has to be done in town, I set off to transact the business and make that my walk; or if there is no business to transact in town, my serving boy leads on my horse to the farm; I follow, and so make the country road my walk, which suits my purpose quite as well or better, Socrates, perhaps, than pacing up and down the colonnade [in the city]. Then when I have reached the farm, where mayhap some of my men are planting trees, or breaking fallow, sowing, or getting in the crops, I inspect their various labors with an eye to every detail, and whenever I can improve upon the present system, I introduce reform. After this, usually I mount my horse and take a canter. I put him through his paces, suiting these, so far as possible, to those inevitable in war, - in other words, I avoid neither steep slope, nor sheer incline, neither trench nor runnel, only giving my uttermost heed the while so as not to lame my horse while exercising him. When that is over, the boy gives the horse a roll, and leads him homeward, taking at the same time from the country to town whatever we may chance to need. Meanwhile I am off for home, partly walking, partly running, and having reached home I take a bath and give myself a rub, - and then I breakfast, - a repast that leaves me neither hungry nor overfed, and will suffice me through the day." Davis, William Stearns, Readings In Ancient History (1912); Freeman, Charles, The Greek Achievement (1999). 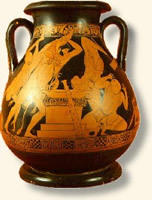 "Everyday Life in Ancient Greece, 4th Century BC," EyeWitness to History, www.eyewitnesstohistory.com (2001). Xenophon (c. 444 - c. 355 B.C.) was an Athenian and an intimate friend of Socrates. In 401 BC he was part of a Greek mercenary army fighting in Persia. When the Greek force was defeated he led the "March of the Ten Thousand Greeks" out of enemy territory and back to Greece. Later, he was banished from Athens and spent much of his life in Sparta.